...some say that his heart ticks like a watch, and that he’s confused by stairs! All we know is he’s our mascot! Richard is a fitness enthusiast who first encountered Medway Fit as one of the beginners on our first ever Couch to 5km group in the Spring/Summer of 2014. Richard has quickly developed into a seasoned runner and qualified as a Coach in Running Fitness in January 2018. Richard regularly swims, gyms, cycles, hikes and runs... in fact we sometimes wonder if he ever sleeps! Richard loves high-intensity workouts having completed the Insanity challenge and many others. Richard often leads our main Thursday night group and enjoys coaching our high-intensity circuits. Richard is married to Zoe who also has a great love for running (they often go on date runs!) and they both completed the 100km Race to the Stones ultra-marathon event in July 2016 with Gordon & Natalie. The quad are due to run Man vs Lakes in July 2018. Dee is without doubt the social hub of Medway Fit. She often processes the results for our local Great Lines parkrun and can be seen networking and encouraging runners from across all of the different running groups across Medway & beyond. Dee keeps our administrative wheels well oiled and manages our online events diary and twitter feed and is also the technical wizard of the group. Dee is the go-to person if you need any advice with how to sync your runs across different devices/websites or on what new tech kit to purchase! Dee recently completed her challenge (the #12in12 challenge) of running 12 marathons between her 39th and 40th Birthdays. Her marathon total currently stands at 24 and she is on her way to becoming an Associate Member of the 100 Marathon Club (aka as the Wannabee Club). June leads her own group, Rainham Fun Runners and has become an integral part of the Medway Fit team since the summer of 2014. June usually leads our beginner and Couch to 5km groups. June has an excellent attitude to running and imparts her enthusiasm and encouragement to others wherever she is. June recently completed the half-marathon distance and may soon contemplate the marathon distance!?!? Kirsty holds the female world record for having completed 0 to 100 marathons in the quickest time. Amazingly Kirsty joined us in the summer of 2014 and in that short time has established herself as an integral team contributor. 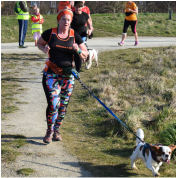 Kirsty loves running with her dog Kingsley and can often be seen encouraging other people on through her own effusive love for running. Kirsty is well know for entering race events to get her 'bling' (medals!!!) and for running several marathons/ultra distance events over a weekend! Kirsty has now completed 175 marathons/ultras including a 100miler event! Peter heads up our Medway Magical Mystery Tour run which explores hidden gems across the Medway Towns. Peter is an avid sportsman and enjoys playing and watching badminton and tennis. Peter likes to keep fit and can often be seen cycling to and from local runs. Peter has an impressive running list of PBs with a half marathon PB of 1:24:42 set at Sittingbourne on 05/04/1987 and an international city marathon PB of 3:05:17 set in Geneva on 10/05/1987. Peter achieved an age-graded parkrun score of 77.25% on 8th October 2016. Paul is an inaugural member of Medway Fit having been at our very first official training session. Paul is often the first person to arrive at our Thursday night sessions along with all of our training kit in tow! Paul has been known to dress up on occasions and in 2014 was seen running as the Easter Bunny, a snowman and a baby complete with huge diaper safety-pin (not all at the same time!). Paul can be seen at Great Lines parkrun every week helping set-up, clear down, take photos, marshall and any other role that needs to be done, sometimes he also enjoys running it! Phil is a key player in the story of our club being birthed in September 2013. Phil has competed as a track & field athlete at regional level and was an accomplished triple jumper. Phil has found a real love for running in the last three years and has an impressive 5km PB of 17:50 (and steadily falling!). Phil is a qualified UK Athletics level 3 track & field coach and has also been a personal trainer as well as a teacher on sports and nutrition. Phil recently completed the 2016 Brighton marathon in 3:20 (his first marathon) and has completed several half-marathon events with a PB of 1:25:29 set at Tonbridge in Feb 2017. Hayley leads our Tuesday night St. Mary's Island run. Hayley has trained with Medway Fit for some time and has become a much-loved member of the team. Hayley can often be seen encouraging other runners on as they graduate from our Couch-to-5KM training programme and develop into Event Group runners by competing in 5km & 10km events. Hayley has completed the Brighton marathon and loves good books and adventures in the wild. Natalie has well and truly caught the running bug since she first joined Medway Fit as a Couch to 5km candidate in 2016. Since then she has taken part in a variety of race distances including the Royal Parks half marathon and Great South Run. Natalie loves encouraging people at our regular training runs and new couch to 5k courses, and she frequently volunteers at Junior parkrun. Anthony is a relatively new runner having joined Medway Fit as part of our Couch to 5km group in 2016. Anthony graduated with flying colours and was soon supporting other newbies on in their own running adventures with his infectious enthusiasm and love for people. Anthony has now pushed on and started training for longer distances and is present at most training runs. Sue undertook her LiRF training on 1st April 2017 (no joke!) and is a regular at both our Tuesday night and Thursday night training runs. Sue completed our Couch to 5km in 2016 and has become a much loved part of the Medway Fit family. Sue can often be seen encouraging other runners and especially beginners along on their running adventures. Sue is completing her first half marathon on Sunday 12th November 2017. Chris is one of 3 coaches to share their birthday on April 10th (useless fact!). Chris is a seasoned runner and loves the local running community. Chris is part of the Gt. Lines parkrun core-team and is often volunteering in various capacities - Chris has been known to don the coveted blue & white Run Directors jacket on occasion! Chris leads our faster paced groups along with Philip Trebill and Peter Young. 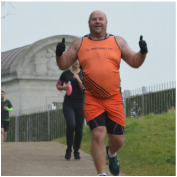 Philip has been a part of Medway Fit since May 2016, soon after he started his running journey. He helps train our faster groups along with Peter Young and Chris Rowlands. Philip has also started trail running this year as a new challenge and to build on his overall fitness. Philips preferred distance is 10k and has a PB of 47.19. Recently Philip has taken part in the East Kent Half marathon and the Tonbridge Half marathon, clocking a PB in Tonbridge of 1.42.43. He hopes to complete his first marathon at Brighton 2018 and also has the Great South to look head to in October 2018. 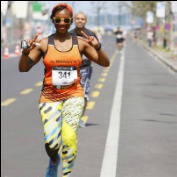 Buffy is a natural encourager who loves championing people on in their running adventures. Buffy enjoys taking part in 5km parkruns and has visited most of the local ones across Kent as a parkrun tourist and is fast approaching her 100th parkrun! Buffy supports our Run Leaders in our club training sessions and is a much loved member of our Medway Fit coaching team. Mrs P is well know for the hashtag #runningsucksbutdoitanyway but we think that she might secretly enjoy it. Zoe has completed races on road, trail and obstacle course. Zoe ran Race to the Stones in 2016 with Richard, Gordon and Natalie and will be joining the same for Man vs Lakes in July 2018. 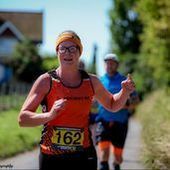 Zoe qualified as a LIRF in 2018 and loves to inspire others to run and help them progress. I started running using the NHS Couch to 5k app in 2014 on my own, under cover of darkness. I did it as a challenge, thinking that nothing would ever get me running. How wrong I was! I then went to Greatlines parkrun where I met the MedwayFit team. Since then I have regularly run with MedwayFit and Rainham Fun Runners. I love to have a race or two in the diary to keep me motivated and have run up to Half Marathon distance. My big joy is seeing other people start running, especially those who may have felt they were too old, too unfit, etc etc, and to provide the encouragement and help that makes people come back for more. I'm pleased to say that I am now happy to run in broad daylight! A “chance” meeting on Bath Spa station in December 1983 saw Andrew taking his first steps towards becoming a runner. A first half marathon and marathon followed in 1984 – followed by a six-year rest. On 27th February 2016, he achieved the distinction of becoming the first man in Medway to complete the feat – and with a gap of over 31 years between number 1 and number 100, was the fourth slowest in the UK to do so (at the time). Paul has run for more years than he can remember as well as having been a keen cycling time trialist and triathlete. More recently Paul has been competing with some success in flat water kayak racing for the last few years before adding running back into his training. As well as his LIRF qualification Paul completed a Level 2 athletics coaching award 15 years ago. David joined Cornerstone Fit just before the change to Medway Fit having started running almost by accident in summer 2015. Since then he has developed into a keen parkrunner, has progressed to 10k and enjoys trail running. As Medway Fit has done a lot for David's family including supporting his daughter though her DofE fitness, he is now going to give back by supporting others in the same way. Sarah joined Medway Fit in 2016 after spending a year running alone & decided to join a running club. Sarah qualified as a LiRF in June 2018 after wanting to offer the same support to others as she had been given at Medway Fit. Sarah has completed many 5k & 10k races, 3 half marathons, along with Brutal & OCR trail runs. Amy started her running journey in January 2016 when she completed a Couch to 5km course. In November 2018, she found Medway Fit and decided to join. Since joining the group, Amy has learnt lots of techniques to improve her running and is now frequently and comfortably running 5 & 10km. She runs with Medway Fit on a Tuesday and Thursday night and runs the Great Lines parkrun on Saturdays. Her goal for 2019 is to firstly train for 10 miles then move onto a half marathon. Amy wanted to become a LiRF to give something back to the running community. She has gone from saying: "There is no way I could ever be a runner," to saying: "I can't wait for my next run!" She enjoys seeing other people achieve new PBs and encouraging people up that next hill! Stewart joined Medway Fit in Summer 2017 after “emigrating” to England from Scotland and has always been a keen runner, even before joining the Army and serving 22 years. 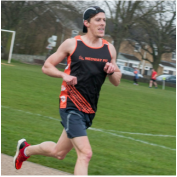 Since joining Medway Fit, Stewart has competed in Half Marathons including 2017 Deal and gaining a PB of 1:55:25 in Hastings in 2018. He has also completed in quite a few 10k races and is determined to break the sub 50-minute barrier, coming close in the 2018 London Winter 10k with 50:43. 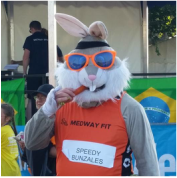 He loves to support Medway Fit with the high-intensity runs including the “Brutal” series and does not mind getting wet and muddy; must be his Army training! 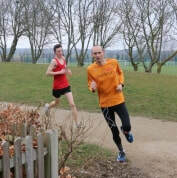 He is also a regular at Great Lines parkrun, both as a runner and volunteer and one of the reasons he undertook LiRF training was because he loves encouraging other runners. He also wanted to give something back to the running club after they made him feel so welcome. Stewart has also completed a few marathons including 1993 London and his last one, 2006 Belfast in 4:00. He has signed up for both the 2018 Loch Ness marathon and 2019 Brighton marathon, to not only to support other members of the club and raise money for charity, but also to prove he can still run this distance even over the age of 50! Stewart other pursuits include squash, badminton, athletics, cycling, hill-walking and swimming and he previously represented the Army at squash. 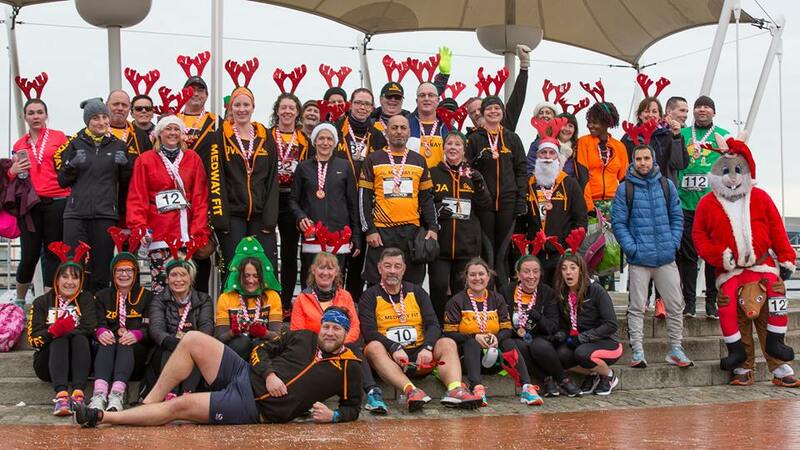 Every single person that runs or trains with Medway Fit makes us who we are! We're so thankful to each and every one for their own unique contribution in making us such a fun, friendly and family focused group - Well done everyone, you're all awesome!